This post will tell a simple fable. The characters are fictional, although the scenario is based on reality. At the end of the fable are some questions that puzzle me. Billy-Bob Smith lives in the small town of Davy in the US South. He worked in the aluminium smelter there, until pressure from environmentalists closed it down. He is now unemployed (and rather bitter). Aluminium production is very energy-intensive (the metal has been called “crystallised electricity”), and the smelter at Davy was fed by coal-fired power. 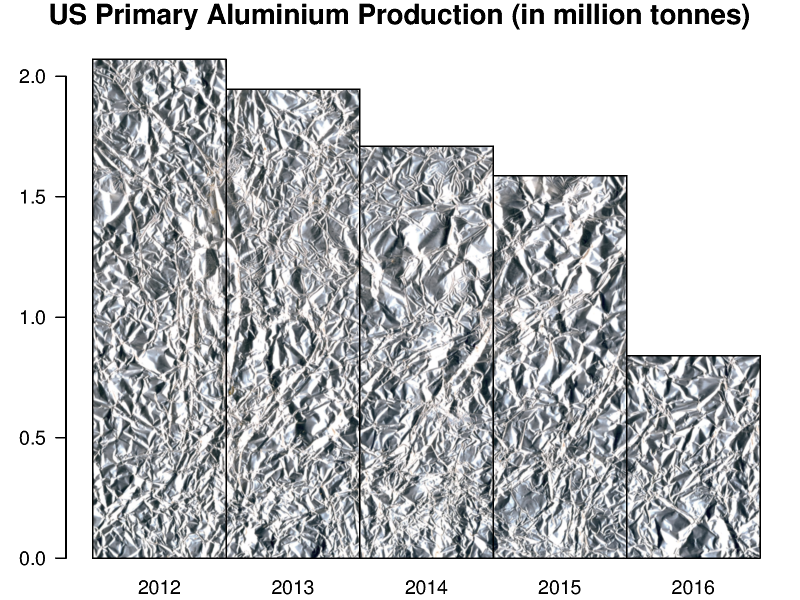 Its demise is part of the general decline in US aluminium smelting (see the chart below, produced from this data). Of course, demand for aluminium doesn’t just go away – world aluminium production is actually increasing. The plant at Davy was replaced within the year by a new plant in China, which was also fed by coal-fired power. In fact, in 2015 about two-thirds of Chinese electricity production (900 GW) was coal-fired. Chinese coal-fired power generation is projected to increase by 20% to 1100 GW in 2020 (making up about 55% of overall Chinese electricity production in that year, given the non-coal power plants that will also be coming on line). For comparison, the new coal-fired capacity being added in China each year is roughly equal to the entire generation capacity of Australia. Billy-Bob Smith is very cynical about the environmentalists who effectively outsourced his job to China, with (as he correctly points out) no net benefit to the planet, and no net reduction in carbon emissions. In fact, Billy-Bob believes that the environmental activists in his state were funded by the Chinese government to destroy American jobs. Needless to say, he voted for Donald Trump in the recent US election. 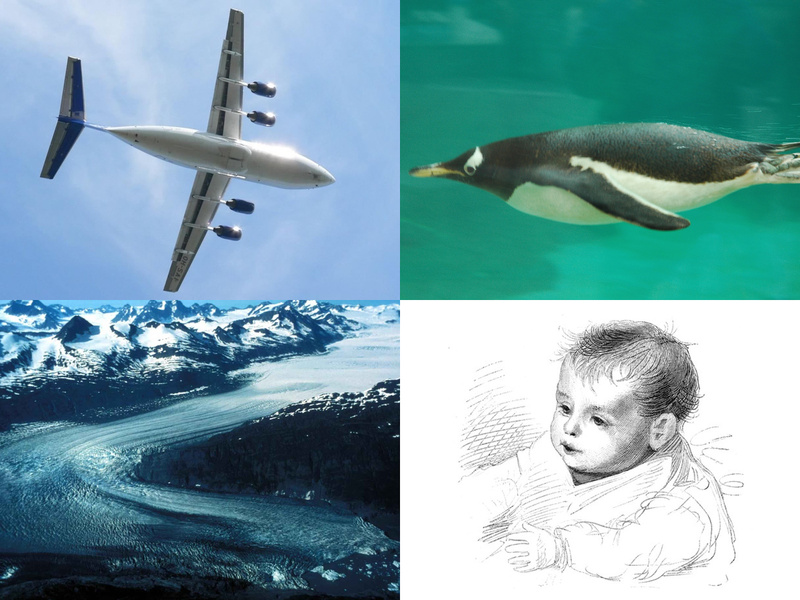 Alicia Jones is a professor of atmospheric physics at a university not far from Davy. She has made significant advances in climate modelling, improving the way that radiative forcing is handled in computer models. There is even talk of nominating her for a Nobel Prize one day. Outside of her university work, she regularly gives talks to schoolchildren on the threat of climate change and the need to address the problem before it’s too late. She also frequently appears on local television. She was part of the group which lobbied to close down the smelter at Davy, in the recent US election she voted for Jill Stein, and she has marched several times in Washington, DC. What makes an intelligent person like Alicia Jones believe that simply moving carbon emissions to China actually addresses climate change? Being fully aware of the usefulness of computer modelling, why did Alicia Jones not do any economic modelling on the expected follow-on effects of closing the Davy plant? Is virtue ethics, deontological ethics, or consequentialism the best ethical framework for handling questions of this kind? In general, does the expertise of scientists lend any credibility to their economic, political, or philosophical pronouncements? Should it do so? What does it say about Alicia Jones’ ability to communicate scientific issues that over 50% of people in her state (people like Billy-Bob) do not believe in anthropogenic climate change at all? What does it say about scientific communication in general? Do problems with peer review affect the public perception of science? What does it say about the education system in the USA that Billy-Bob does not even believe that the earth is warming? After all, many US cities have temperature records going back over a century. 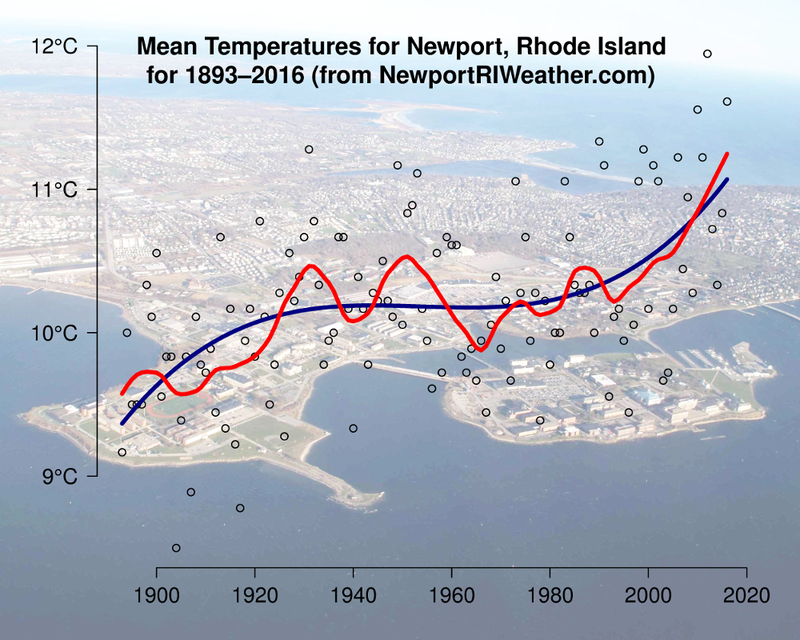 Mean temperatures for Newport, RI, for example, show a 1.7°C rise between 1893 and 2016 (see chart below – the blue line is a cubic interpolation, while the red line is the result of loess smoothing). What can be done to improve this particular debate? 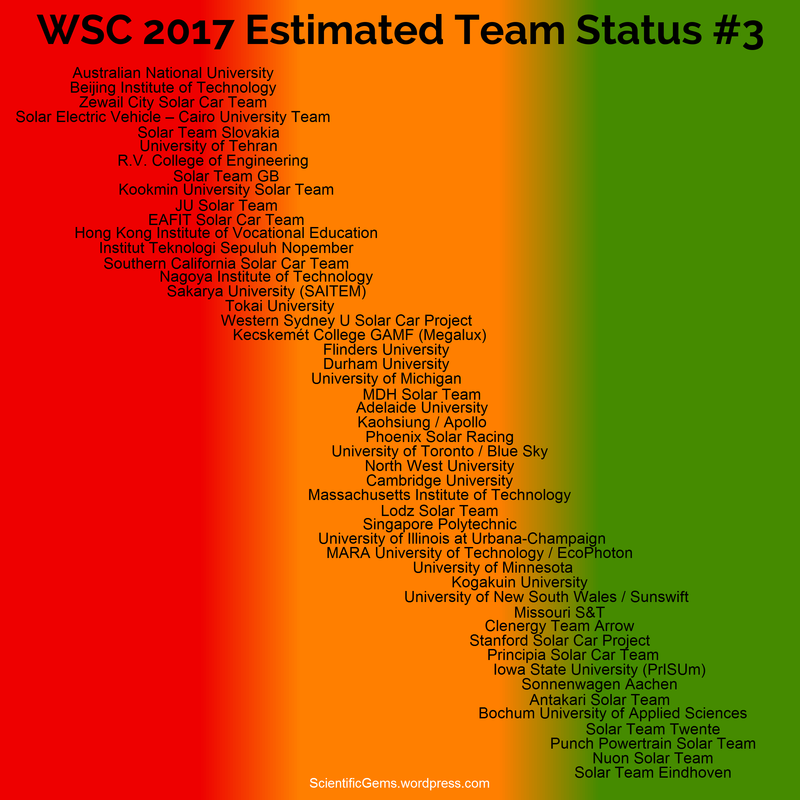 Six months to go to the World Solar Challenge, and the infographic above (third in the series) shows solar car teams that are likely to be entering in the World Solar Challenge this October, with my estimate of reported current progress (on a red–amber–green scale), taking into account recent social media updates. The team list has also been updated, and has a simpler traffic-light version ( ) of these estimates. Since the last update, a few teams have started construction. Twente has revealed their new design (with more details in Dutch). Two Egyptian teams have been added to the list, but they have a lot to do before the big event, and I’m not sure if they will make it. We live in an amazing world. Giant metal machines fly through the air, supported only by Bernoulli’s principle. Birds fly through water rather than air. Giant rivers of solid ice scour their way through mountains. But most amazing of all is the creation of a new baby. Speaking of which, I’m an uncle again! In 1989, I started my first lecturing job, at Griffith University, Brisbane, Queensland. My PhD was all but finished and – more importantly – my scholarship money had run out. That was the year that Stanley Pons and Martin Fleischmann announced that they had discovered cold fusion. They had not. I’m glad that I was being more careful in my own work. 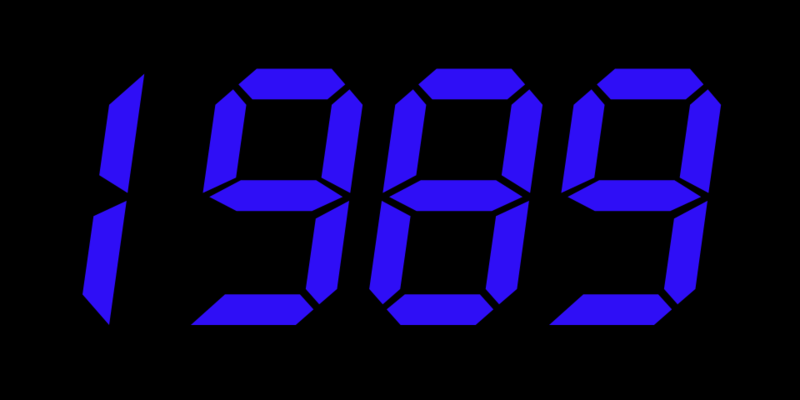 Konrad Lorenz, William Shockley, and Andrei Sakharov all died in 1989, while Isamu Akasaki developed the now-ubiquitous GaN-based blue LED. Tim Berners-Lee designed the World Wide Web, the Tiananmen Square protests took place, the Berlin Wall came down, George Bush became President of the USA, and the Soviet–Afghan War ended (Bush’s son was to start his own Afghan war in 2001). The spaceprobe Voyager 2 (launched in 1977) visited Neptune in 1989, and took some lovely photographs. In the world of cinema, Batman, Indiana Jones and the Last Crusade, and The Fabulous Baker Boys were released. Books of 1989 included The Remains of the Day by Kazuo Ishiguro, An Acceptable Time by Madeleine L’Engle, The Writing Life by Annie Dillard, and Wonderful Life by Stephen Jay Gould. An interesting year, on the whole. An earlier post touched on the concept of “cultural appropriation.” This label is often applied inappropriately, because the world is more interconnected than most people realise. It has been that way for longer than most people realise (for example, some 4,000 years ago, tin from England was being traded across the Mediterranean sea for use in making bronze). And ideas go back further than most people realise. Consider blue jeans, for example. Blue jeans are dyed with indigotin, a chemical derived from the indigo plant, which has long been grown in India. But before someone says “cultural appropriation from India,” indigotin was traditionally derived in Europe from the woad plant (northern Britons painted their skins blue with woad). In China, a different plant was used. Essentially, the use of indigotin was a cultural universal. In Germany, where a culture of excellence in organic chemistry grew up during the 19th century, a practical method for making synthetic indigotin was developed at the BASF company in 1897, and the choice of plant became moot. Blue jeans are made from denim, a fabric named after Nîmes in France. During the California gold rush, Levi Strauss, a Jewish-American businessman of German origin, teamed up with Jacob Davis, a Jewish-American tailor of Latvian origin, to make denim work clothing for miners. These blue jeans were strengthened by metal rivets – an idea due to Davis, patented in 1873. So which culture produced blue jeans – Indian? French? German? Latvian? Jewish? American? One can only say that blue jeans were produced by human culture. 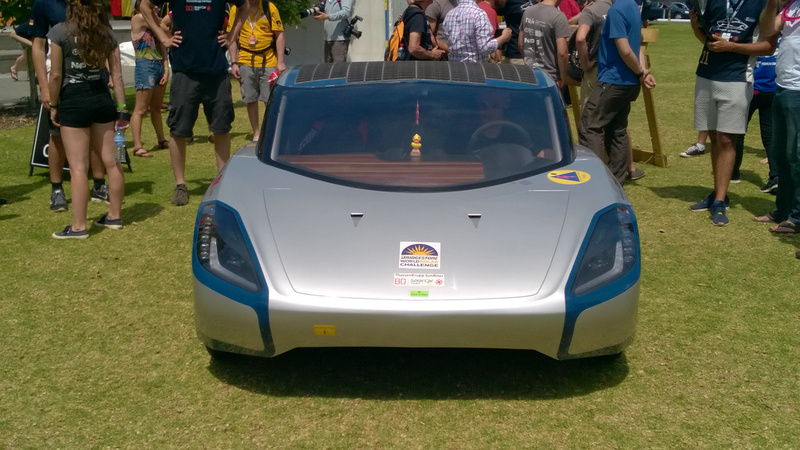 Time for an update on the Somabay Egyptian Solar Challenge. Scrutineering was due to have begun, but apparently all the cars are still held up in customs. Hopefully the race itself will still start on the 17th. Apparently the route will run north and south along the Red Sea shore for four days, and finish at the Pyramids of Giza on the fifth day. 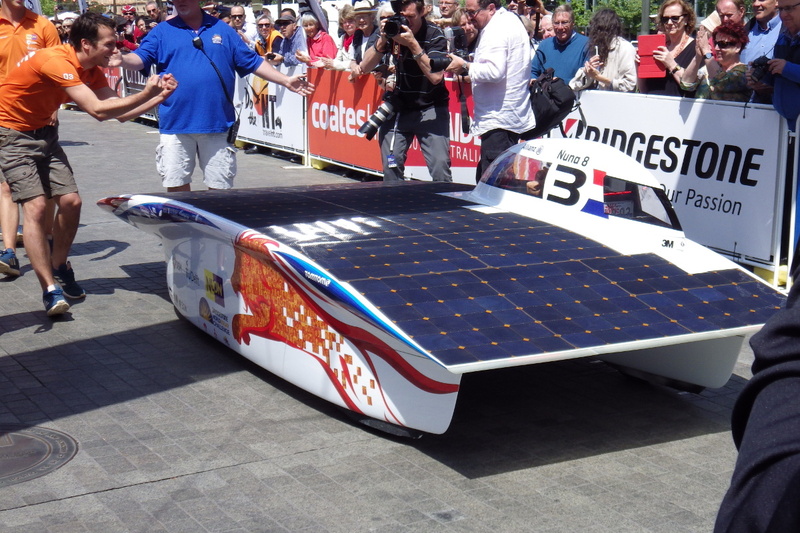 Bochum are putting up very detailed daily blog posts (in German) at bosolarcar.de/themen/news. Their local partners from Cairo University are active on Facebook (and, amazingly, auto-translate works well). This Breton team is active on Facebook and Twitter (click on the icons above). Nuon is extremely active on Twitter, posting news, pictures, and short videos. Update 1: apparently the race organisers have no permit to conduct the race as planned. The race will therefore be reduced to a 2-day event, running laps around the Somabay resort complex. Update 2: Nuon has a report on the event here. It’s Pi Day again today (3/14 as a US-style date). The piday.org website seems to not have been updated much, but the celebration in the US seems bigger every year. This year, a great many bakeries and pizza shops seem to be offering discounts.